When I first fired up BlazBlue: Clone Phantasma, my expectations were low because I didn’t know too much about the series. I knew that the games were typically fighting games and that the Internet’s otaku at large typically swoon over them. I’m no stranger to oddball Japanese pop culture (we can talk about my Super Sentai addiction later), so I thought I really had nothing to loose by giving the game a go. I advanced past the title screen of the game and selected, then I was immediately given a character select screen. The character’s descriptions were vague and basically amounted to a name and four or five words telling you about a weapon they possessed or a fighting style they utilized. That seemed a little vague, even for a fighting game, and immediately felt like I might have missed something. Since I couldn’t really tell which character may have an advantage over another, I chose a guy with green hair and a dapper looking fedora. The first stage began with the character I chose starting off in an arena and enemies spawning in waves around you. It was hard to tell if I was supposed to kill the enemies, avoid them, or perhaps see if you can recruit them for your neighborhood’s knitting circle. 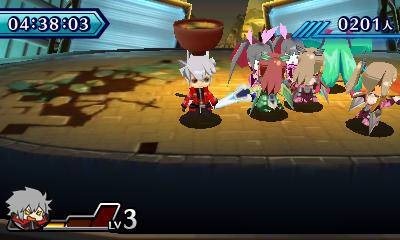 The enemies attacked my adorable little fighter, but he seemed impervious to damage unless they managed to force him off the edge of the arena’s platform. Attacks were pretty simple three-button combos, and if you ever got confused or forgetful about what button does what there was a constant reminder on the 3DS’s bottom screen. 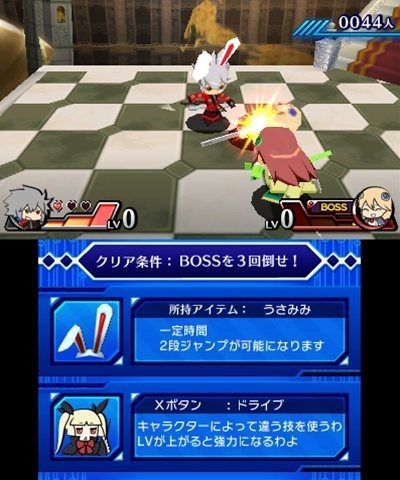 Attacks and combos got stronger as the character advanced in levels, up to a maximum of three. If one of the computer controlled goons manages to knock you off the platform, you reset to level one but it increases back to three so quickly it hardly seemed like a penalty for plunging to your death. After a few stages of similar action that all seemed to blur together, I fought a boss that could quite possibly be the easiest boss in recorded video game history. I’ve read that the bosses you fight can vary depending on which character you start out with, but it is hard for me to imagine any of them presenting much of a challenge. After I defeated her, I expected to be shown some of the game’s story, but all I got were some nebulous blurbs of dialogue that didn’t really answer any questions or empathetically connect with any of the characters.. I was left wondering just why these people were fighting, who they were, and why exactly I was supposed to care if they lived or died. To sum it up, BlazBlue Clone Phantasma is a game that doesn’t have enough of anything. There isn’t enough story presented to pique my interest, there isn’t enough depth to the characters to make me empathize with them, and there isn’t enough complexity or depth to the combat system to make it a game that could hold my attention. Had this been a classic fighting game, à la Street Fighter, it could have been a more worthwhile way to spend my time – and I say that as a person who doesn’t typically like fighting games. It’s obvious I am not in this game’s target audience, but it’s a shame it couldn’t have been made a little more approachable so it could serve as an entry point for new players interested in the series.